ADSL makes use of spare frequencies not used by the telephone voice band in the telephone wire, but it can only carry analogue signals in the local telephone loop. Because our computers use binary code, we need an adsl modem/router to convert this digital data into analogue signals which can then be carried over the telephone wire. At the other end of the line another modem converts the analogue signal back into digital data. Converting digital to analogue signals is called modulation and converting analogue tones into digital is called demodulation. Hence the name Modem (Modulation demodulation). Digital data is represented as binary digits (bit for short). Each bit can have either one of two different states - Off or On (0 or 1). = 16 8 bits = 1 Byte. As an example see text to binary converter which will convert text into binary code and vice-versa. Data that is to be transmitted is broken up into a series of smaller chunks. Each of these blocks is then "wrapped" with some additional data called a header. The header will contain information such as where the packet has to go, where it came from, its sequence and also some additional information which may be used for error detection. The original data is called the payload. The easiest analogy is to think of the payload data you are sending as being a letter, whilst the data contained in the header is the envelope. During data transmission you may hear the term "Overheads", this is the additional data which is transmitted in the header (and footer if applicable). Depending upon the network type packets may also be referred to as data cells or frames. Payload may also be referred to as the "useful" data. The number of bits/Bytes in each packet can depend on the protocol used (eg TCP, IP, UDP, ATM), but each protocol will also be constrained by a minimum and maximum packet size. A typical TCP/IP packet could contain up to 1500 bytes, of which 40 Bytes will be overheads. (20 Bytes each for TCP and IP). Its very likely to have many different "layers of wrappings" as your data traverses across different parts of the network or more specifically adsl network and out on to the Internet. Each of these wrappers will contain specific information in the header for that part of the network. For example PPPoA (PPP over ATM) or PPPoE (PPP over Ethernet), these different layers will increase overheads. A protocol used to transfer data between 2 points. Unlike some other protocols, a connection is established before data transfer commences. Data is split into small fixed sized cells in an attempt to reduce jitter when carrying voice traffic or video. * Allocated to VPI in NNI systems. One of the reasons a 512 kb adsl connection will sync at 576 kbps is to allow for such things as ATM overheads. Even with this allowance the actual throughput speed of the payload is likely to be in the region of 480 kbps due to the required TCP/IP overheads used within our own network by our PCs to ensure safe and correct delivery. During the transfer of data, there may be occasions where part of the data for some reason or other gets corrupted or lost. A common reason could be electro magnetic noise on the line and therefore there are various error detection and correction methods which check and ensure data packets haven't been corrupted. PTM packets are variable in size (up to 1500 bytes or more) and have a header overhead of just a couple of percent. ie 8 byte overhead on a 1500 byte packet. Therefore the overhead savings can be quite substantial and you get more efficient throughput. PTM is said to be far more efficient on lines which sync at >10Mbps. 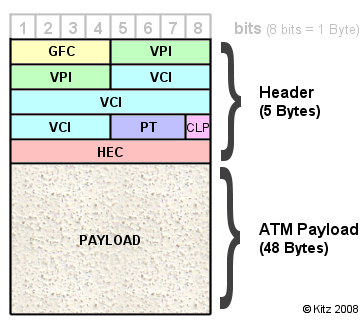 ATM with its smaller packet sizes are said to be better for latency critical applications such as VoIP. - For more info see: Ethernet in the first mile. Packets are commonly used to describe messages at the Network layer - eg IP packets, although it can be used generically to describe data at any level. Cells are usually of a fixed size length. Frames are most commonly used to describe messages at lower levels of the OSI Reference Model. The name "frame" arises due to protocol packets which may be wrapped (or framed) by others.